Not only has Mozilla improved upload speeds, but it's expanded on how much control you have over the the file(s) you send. You dictate when the link expires, who can view it, how many times it can be downloaded, and if it will have a password for even more security on top of the end-to-end encryption. 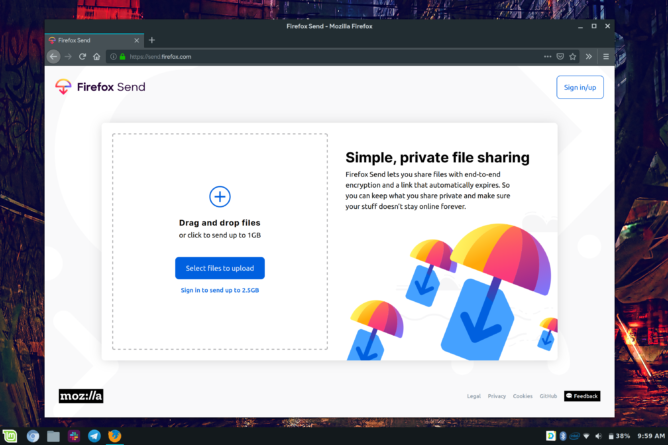 If you're on the receiving end of Send, the process will be equally simple: you'll get a link to download the file without the need for a Firefox account, and that's it. Anonymous users will be able to send up to 1GB files while Firefox account owners will get 2.5GB. For the time being, it's limited to a website, send.firefox.com, but Mozilla says that an Android app is coming later this week. Though a tad bit late, Firefox Send is now available on the Play Store and from APK Mirror. Just download it from the widget below or from here.